Two days ago, Vikash Dhorasoo announced that he was retiring from football. He started playing at Le Havre AC, then spent a few years at Olympique Lyonnais (where he won two French championship medals) and even played for Milan AC (he was on the bench during that most dramatic Champions League final ever…). He was a member of the French national team and played during the 2006 World Cup. Incidentally, he arrived at Lyon when Christina and I were studying there. We went to watch his first match ever for the club against Atletico Madrid and he was excellent. We even went to the same cinema once except that he was waiting in another queue and we did not have the courage to go and talk to him… Talking of cinema, Vikash Dhorasoo will also always be known as the football player who directed a film. 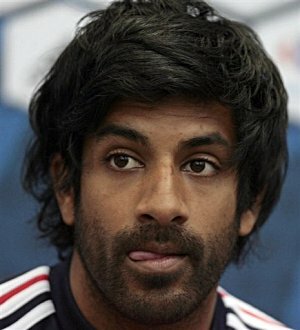 He played for the Mauritian team once during an exhibition match against Marseille and he was the best player by far. I wish him good luck for the future. Le malheur de Dhorasoo, c’est qu’au momment qu’il etait a son summun, il y avait un certain Zidane qui occupait un poste similaire dans l’equipe de France. I wonder if he feels more French or Mauritian. This makes me think about Faudel’s song. In my heart, I will always be Mauritian “car c’est ici que je suis né,” but if my wife and I have kids, I think they will feel more Canadians than Mauritians. Sad but true. i fink he’s a great footballer, a real playmaker. That move to AC Milan wasn’t a gud idea though…hard to claim a regular spot wiv the likes of gattuso and kaka in midfield!! mauritian football players, there are lots … but there are not much that gets a chance like vikash got. Selven: Very true. Had his parents not moved to France, he would have been born in Mauritius, and maybe never turned into a great player. Is football a game anymore?